Landowner disputes continue between Mapuche and Chilean landowners, and it is argued they will only get worse unless the Chilean governments steps up and intervenes to alleviate the tension. However, this seems unlikely to happen, as there are still those who deny the existence of “the Mapuche Problem”, which in turn impedes any attempts to find a solution. The Mapuche are the original inhabitants of Chile and Argentina, and they’ve been defending their area from Spanish invaders and the Republics of Chile and Argentina for centuries. One of the biggest blows to the Mapuche occurred between 1860-1885 when 100,000 Mapuche were massacred and more were dispossessed in a joint military effort between Chile and Argentina. This tragedy planted the seed of one of the most drawn out land disputes in history — the conflict between the Mapuche and Chilean landowners. New evidence suggests that this conflict has only gotten worse — and it will continue to escalate — without government intervention. During the 19th century massacre and dispossession, the Chilean government gave Mapuche ancestral land to private landowners and left the indigenous people destitute, reports Nicolás Ríos for VICE News. This first wave of attacks against police and private property laid the foundation for an anti-terrorist law being used against the Mapuche. The corrupt law is a huge human rights violation because it limits the Mapuche’s basic human rights, including freedom of movement and due process, and it gives Chilean authorities the power to “lengthen preventive detention and use anonymous witnesses,” explains VICE News. The government blatantly paints the original people as terrorists in the eyes of the Chilean public. But the issues run much deeper than a terrorism label. Picture a big pot that’s been simmering with over 500 years of land disputes over 81.5 million acres of stolen Mapuche territory, social and cultural discrimination, political marginalization, a subhuman regard of the Mapuche people, extreme poverty and police brutality. Things are bound to get ugly. On the other end of the spectrum, landowners, both big and small, are defending the land. Businessman Juan de Dios Fuentes, who controls 494 acres, tells VICE News that he’s lost $2.7 million because of the Mapuche attacks against him and his property. Fuentes justifies labeling the Mapuche as terrorists, saying “we have never been robbed, because the attacks are aimed at generating fear, so that we go away and leave these lands for them.” The businessman adds that the Mapuche should be compensated for their land instead of the government returning it to them because as it stands now, the policy “is creating a wicked incentive for the attacks against us to continue,” argues Fuentes. Fuentes is right: the Chilean government stole the land from the Mapuche, sold it off to landowners and continues to instigate animosity between the two groups till this day. When Francisco Huenchumilla (of Mapuche descent) was named an Intendant of Araucanía in 2014, he asked both parties for forgiveness on behalf of Chile. And he was paving the way for conflict resolution by almost “submit[ting] a plan to end the area’s violence that included parliamentary representation for Mapuche, buying land for indigenous people, and an economic compensation for the victims of the conflict,” reports VICE News. But after months of acting as an Intendant, Huenchumilla was stripped of his title and replaced by Andrés Jouanne. 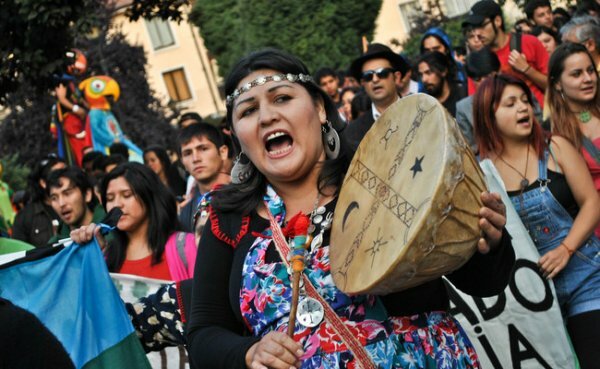 According to Jouanne, “There’s no Mapuche conflict,” and, ultimately, there’s no solution. Violent conflicts between the Mapuche and Chilean landowners have only gotten worse with time, and they’ll keep escalating until the Chilean government steps up. Sign and share this petition demanding that Chilean President Michelle Bachelet acknowledge the conflict and takes the appropriate steps towards a resolution.